What to know: Fun, bright, clever. Ah yes! This is exactly the type of film we look for. Fun, bright, clever... I love how these triangles reconfigure to make different shapes, all in time with the music. I could watch this for a long time. It's almost meditative. Kudos to Simo Liu for creating such a fun piece. Love to see more of her work. I recommend this for ages 3 to 18, as well as adults and give it 5 out of 5 stars. Reviewed by Julie S., KIDS FIRST! Adult Juror. 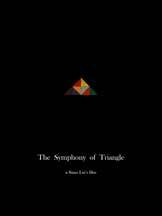 The Symphony of Triangle is stop-motion animation that plays with different triangles for fun!